This is a review for a supplement called Addrena. The manufacturer claims that this supplement will improve studying and productivity. Read on to learn more about this product and whether or not it is the ideal choice for you. Guarana- Boosts energy, focus and concentration. Bitter Orange- Works as a concentration and energy supplement. Yohimbe Bark Extract- Has legal stimulant and thermogenic effects and acts as an aphrodisiac. Choline Dihydrogen Citrate- Works to improve concentration and attention. Acetyllcarnitine- Works to improve attention. Bacopa Extract– Works to improve learning, memory and concentration. Acetylltyrosine- Works to increase focus and concentration. Caffeine– Works to improve memory and learning. DMAE- Works to positively influence alertness and mood. Vitamin B3-Works to improve attention and has neuroprotective effects. Vitamin B12- Works to help body release energy. White Willow Bark Extract-Works to increase the effects of herbal stimulants, attention and decrease body fat. Piperine- Works to increase the uptake of supplements and nutrients. Huperzine-Works to improve focus and concentration. It is recommended that one pill be taken daily. Users can take up to two pills if they space out the dosage. There were no possible side effects listed on the manufacturer’s website, but that does not mean there are none. It was noted that this product should not be taken with caffeine because it already contains caffeine and energy supplements. This product costs $39.99 for a bottle. Each bottle contains 60 tablets, which is a 2-month supply. The manufacturer does not appear to offer a guarantee with the purchase of this product. Many may find this an issue because they may not be able to return the product if they are not satisfied with the results. The manufacturer’s website has several customer reviews and testimonials available. All of the testimonials found on the site are positive, which may make some customers feel better about purchasing the product because they have proof that the supplement has worked. Addrena is said to improve studying and productivity. There are several customer reviews and testimonials on the manufacturer’s website that back up this claim. Knowing that it has worked for so many other people may encourage someone to purchase this supplement, but they should keep in mind that individual results may vary. Just because this supplement worked for someone else does not mean it will work for you. With the lack of guarantee, if you find that it doesn’t work for you, you may not be able to be refunded. The price is affordable and fair for the quantity of pills you get. Most bottles of supplements only contain a month’s supply, but Addrena supplies customers with two months worth of pills. 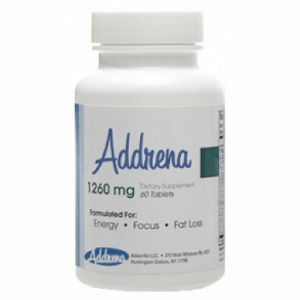 Overall, Addrena seems like a good supplement and it may work for you. Henry Costa	reviewed Addrena	on June 14th	 and gave it a rating of 2.5.